The deservedly popular tribute group Remembering Chet – a swinging trio with Iain Ewing (vocals) and Colin Steele (trumpet) reflecting the twin facets of the late, great Chet Baker’s music-making, and Euan Stevenson (piano) accompanying them – has been a staple of the last few Edinburgh Jazz Festivals. For this year’s event, on Saturday lunchtime, the band added a new dimension by bringing baritone saxophonist Billy Fleming in to the mix, thus allowing them to broaden the programme out to include some of the classic numbers Baker recorded with Gerry Mulligan in the 1950s. It certainly gave the group – which, Ewing explained, he had been about to retire – a new lease of life; Fleming’s graceful baritone forming a formidable front line with the ever-eloquent Steele trumpet, notably in their unaccompanied climax to Bernie’s Tune, one of the compositions famously recorded by Baker and Mulligan’s radical piano-less quartet but here benefitting also from Euan Stevenson’s elegant keyboard skills. As for those melancholy songs, Ewing – like Steele on trumpet – did his usual terrific job of stylishly channelling the Baker hallmarks – wistfulness, a soft, gentle tone, simplicity and vulnerability – while avoiding sounding like an impersonator. The many highlights included I Get Along Without You Very Well, which featured an exquisite, Satie-esque accompaniment from Euan Stevenson. Wow. Sunday evening’s concert at the smaller Spiegeltent could well turn out to be one of the top highlights of this year’s jazz festival for those of us “lucky” enough to be shoehorned into one of the wooden pews by the brigade of battleaxes running the George Square venues. Celebrating the groundbreaking Birth of the Cool series of recordings, the concert reflected not only the iconic tracks laid down by the Miles Davis-led nonet from 1949 (that were eventually released as the seminal, 1957, BOTC album), but also rehearsals and broadcast material recorded by the same line-up during its brief lifespan. If all this sounded like we were in for a potentially po-faced, academic project – and it certainly seemed that way when the headmasterly-looking musical director Richard Ingham was making his opening comments – then those concerns were quickly blasted away by the inadvertent comedy that ensued when a cue was missed for a re-enactment of the band’s first live broadcast. Instead, we were treated to a blissful hour of the lush, slightly ethereal harmonies featured in the distinctive arrangements and compositions of Gil Evans, Gerry Mulligan et al – and it was a rare thrill to hear such classics as Jeru, Moon Dreams, Move and Godchild being played live and with such panache and obvious enjoyment by this superb nine-piece outfit which included several students. It may sound like the title of a show, but Remembering Chet Baker is the name of the Scottish trio which, for the last four years, has been celebrating the music and musical style of the jazz icon who died prematurely 28 years ago. As they hinted during Monday afternoon’s performance, there’s not much point in celebrating Baker’s life or him as a person: he seems to have hurt everyone in his life and, by all accounts, was really not a very nice human being. That, combined with the inescapable fact that Baker was a master of melancholy famous for such mope-fests as the misery-laden ballads The Thrill is Gone and You Don’t Know What Love Is could have made one suspect that this would not be the cheeriest way to spend a Monday afternoon. However, nothing could have been further from the truth – thanks to the fact that singer/presenter Iain Ewing punctuated proceedings with cheeky patter, and kept the mood light. Both Ewing and trumpeter Colin Steele, who was on top form, have clearly been influenced by Baker’s lyrical, pared-back style and gentle, soft tone – but, refreshingly, neither attempts to mimic him or recreate his solos. It’s as if both musicians have been so steeped in Baker’s recordings that they can give the standards associated with him a lovely, Baker-esque, flavour, without resorting to impersonations. Among the specific highlights were the classy, upbeat opener There Will Never Be Another You, which featured the first of a series of gorgeously understated solos by Steele; pianist Euan Stevenson’s elegant, Satie-like accompaniment on I Get Along Without You Very Well, and the two instrumentalists’ electrifying duet on All the Things You Are. How can you keep ‘em down on the farm after they’ve heard the all-star ensemble that took to the George Square Spiegeltent earlier in the jazz festival week? That Monday night concert, which boasted a front line that included American stars Warren Vaché (cornet) and Scott Hamilton (tenor sax), was still the talk of the town by Friday evening when the similar, but slightly scaled down, all-Scots line-up led by clarinettist/saxophonist John Burgess took to the St Andrew Square Spiegeltent stage. But whereas the Monday concert had been edge-of-the-seat stuff, with every number a showcase for one genius or another and the musicians playing to a rapt audience, Friday’s – or at least the first half – was more the sort of gig folk spill into after work, and the music was the ideal accompaniment to a an early evening drinking session rather than something that made you want to hang on to every last note. The Friday-night-in-the-pub atmosphere certainly extended to the back of the tent where there was some distinctly boorish and intimidating behaviour unravelling as the band played on. Things improved in the second half which featured some majestic and pared-down trumpet from Colin Steele on Someday You’ll Be Sorry and Everybody Loves My Baby, and a lovely, lyrical clarinet feature from John Burgess on I’m In the Market For You, which he dedicated to his hero, the famous Edinburgh clarinettist Archie Semple, plus some characteristically inventive drumming from John Rae who, along with Campbell Normand (piano) , was not the musician advertised in the festival programme. * Colin Steele & Brian Kellock: My Fair Lady, The Jazz Bar, August 9th & 23rd. 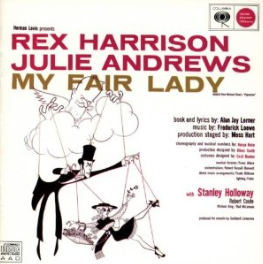 The wonderful songs written by Lerner & Loewe for the 1956 Broadway musical version of Pygmalion have long been favourites of discriminating jazz musicians – especially trumpeters, from Chet Baker to Ruby Braff. Now, for the first time, it’s the turn of the lyrical Colin Steele and his dynamic pianistic partner in crime, Brian Kellock, to serve up their take on such loverly melodies as The Street Where You Live, Show Me and I Could Have Danced All Night. With a little bit of luck, they’ll invite the audience to shout out the key line on The Ascot Gavotte. ..
* Remembering Chet, The Jazz Bar, August 16th & 18th. Scottish vocalist Iain Ewing’s must-see homage to the great Chet Baker was a winner at the Edinburgh Jazz Festival and last year’s Fringe … Accompanied by the Baker-inspired trumpet of Colin Steele and Euan Stevenson’s classy piano, he sings and swings with a Chet-like simplicity and elegance, while putting his own stamp on a string of classic Baker songs. No need to bring the hankies in readiness for Baker’s tragic life story; Ewing’s patter is witty as well as informative. A funny – and stylish – valentine. 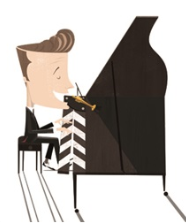 * Joe Stilgoe – Songs on Film, Assembly Checkpoint, August 4th-22nd. Mr Stilgoe’s love of film shone through on his fab solo show a couple of years ago, when he seduced the Fringe audience with a bittersweet ballad inspired by the masterful, bittersweet Billy Wilder movie The Apartment – (That’s The Way It Crumbles) Cookie-Wise. Now he’s back with a trio gig entirely themed around songs from the movies, including (if the CD of his London Jazz Festival Songs on Film concert is anything to go by) a mixture of more of his original tunes as well as favourites from his formative years in film buffery. * The Cabinet of Caligari, The Jazz Bar, August 13th-15th; 18th & 19th. And speaking of film, if you like your silent movies to be screened with atmospheric original music, check out the screenings of the Expressionist classic The Cabinet of Doctor Caligari (1920) which will be accompanied by a performance by guitarist Graeme Stephen of his new, specially written score. * Jazz Rite of Spring, The Jazz Bar, August 20th-24th. Pianist David Patrick’s reimagining of Stravinsky’s groundbreaking and riot-inducing masterpiece has been critically acclaimed; my Herald colleague Rob Adams describing it as “highly credible and genuinely exciting”. I haven’t heard it yet but am intrigued by the “12” certificate. Maybe they’re expecting Paris-style trouble; let’s hope The Jazz Bar has the riot police on speed dial..
Free jazz can mean two things. It can connote jazz that’s wholly, wildly, improvised – and it can mean amateur hour. And that’s where this year’s Leith Jazz Festival turned out to be the exception that proves the rule. Why? Because over the course of two and a half days, it offered punters the chance to hear not just good jazz, but also world-class jazz – and all for the price of a pint (or three). Returning to the festival for its third year, alto saxophonist Martin Kershaw must have had deja vu as he took to what passed for the stage area in Sofi’s on Saturday. His duo gig there with bassist Ed Kelly was one of the highlights of 2012, and the follow-up was just as memorable – though this time it had the added appeal of a canine floorshow as it coincided with the monthly meeting of local dog owners and their pooches. Kershaw and Kelly dished up a wonderful afternoon of cool, classy swinging jazz, with an especially slow Manha de Carnivale and the beguiling, Stan Getz-associated, ballad With the Wind and the Rain In Your Hair among the highlights. A second helping of Kershaw’s airy, eloquent sax was a must on Sunday at the Isobar where the 1950s West Coast sound was evoked by him, trombonist Chris Grieve and guitarist Graeme Stephen, a sublime sounding combination which – appropriately enough, given that Leith’s twin city is Rio de Janeiro – worked especially well on a couple of bossas. The Isobar also played host to another of the weekend’s stand-outs: a duo gig by trumpeter Colin Steele and guitarist Lachlan MacColl. The joint was jumping so much that MacColl’s douce guitar playing got lost in the lively ambience, but Steele certainly made himself heard, not least on an especially funky Blues March and an uptempo, boppish All the Things You Are – the second of three outings for the Jerome Kern classic that the Isobar witnessed over the weekend. For anyone who fondly remembers the old Edinburgh Jazz Festival pub trail, the Leith event is its 21st century incarnation. 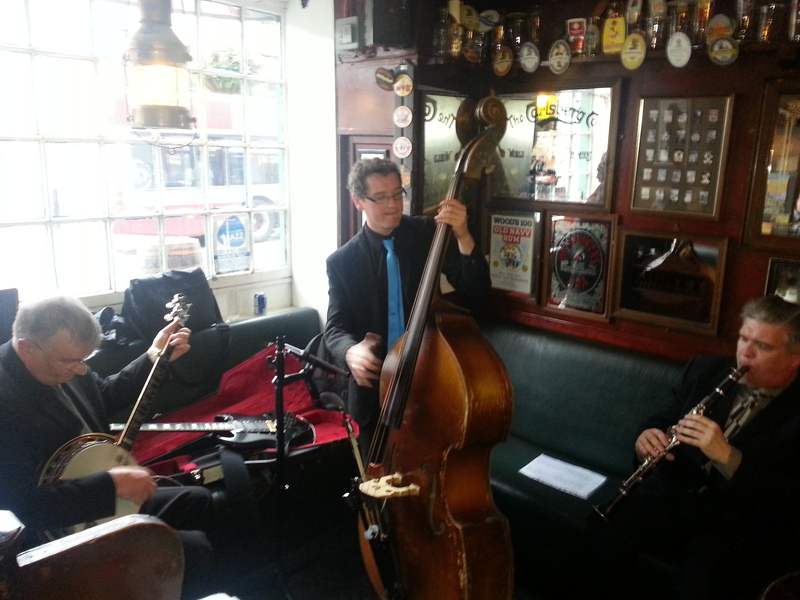 The spirit seemed to prevail most strongly at the Saturday afternoon gig by The Ugly Bug Ragtime Three (pictured above), a clarinet-bass-banjo/guitar trio recently hatched by leader John Burgess. If only there had been more breathing space in the packed-out Malt ‘n’ Hops pub, there would almost certainly have been an outbreak of slow dancing along to the Uglies’ gorgeous, gently swinging How Come You Do Me Like You Do. Ah well. Maybe next year … the festival is still young.